Benedictine Sister Julie Sewell professed perpetual vows as a member of the Sisters of St. Benedict community at Our Lady of Grace Monastery in Beech Grove earlier this year. She is the daughter of Gary and Rosemary Sewell of Cincinnati, Ohio. During the July 17 liturgy in which she professed her vows, Benedictine Sister Juliann Babcock, prioress, placed a ring on her finger cementing Sister Julie’s desires to be a member of her Benedictine community for life. A significant portion of the liturgy is the entire community greeting Sister Julie. During this special sign of peace, community members congratulate the newest member, and offer their support and love. 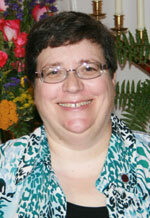 Sister Julie became a postulant at Our Lady of Grace Monastery on Sept. 7, 2005. After her conical novice year, she began working in the development office at the monastery. In 2010, Sister Julie was appointed director of spirituality at the Benedict Inn Retreat and Conference Center, her current ministry position. Sister Julie has two younger sisters, Jill Sewell of Cincinnati, Ohio, and Jackie Danielson of Long Lake, Minn.
She graduated from Ursuline Academy then earned a bachelor’s degree in history and philosophy at Edgecliff College of Xavier University in Cincinnati.